Napoleon Buonaparte created one of the most extensive empires in European history. At the summit of his power in early 1812 just before the invasion of Russia, he controlled all of central and western Europe, Italy, Spain, all of Germany and the Low Countries, Poland and much of Austria. Only England and Russia still stood outside of his grasp. In 1812, he launched the Russian campaign that was to spell his end. Within one year his empire was in tatters and he was on his way to defeat and eventual imprisonment. Birth of Napoleon Buonaparte on Aug 16. Ajaccio, Corsica. Napoleon, age 10, enters Royal military school. Brienne-le-Chateau in France. He receives a scholarship. Other boys make fun: short, bad French. Napoleon enters prestigious Ecole Militaire de Paris. Hates German, likes math ("He is quiet and solitary, capricious, haughty, and frightfully egotistical. . . He is most proud, ambitious, aspiring to everything. . . "). Napoleon watches the masses storm the Tuileries palace. The public humiliation of King Louis XVI. Such scenes strike life-long horror of the uncontrolled crowds. Execution of the King of France: King Louis XVI. War: France declares war on Great Britain. Assassination of revolutionary leader Jean-Paul Marat. Assassin is young woman, Charlotte Corday. (painting by David). Buonaparte family flees revolutionary chaos. Leaves Corsica for France. Robespierre joins the Committee of Public Safety. The Terror now at its worst in 1793. Napoleon leads French forces in battle against English at Toulon. Returns to Paris as revolutionary hero: "Citizen Buonaparte," Makes friends with Robespierre's brother. Napoleon very close to most extreme revolutionary circles. 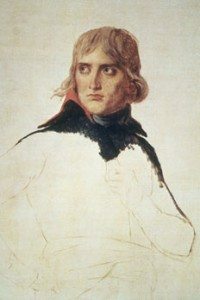 Napoleon sent to Genoa to negotiate with government. Thus is fortunately absent from Paris at moment of the crisis of the overthrow of Robespierre summer 1794. Napoleon back in Paris, ordered to defend the revolutionary gov. Crowds threaten gov, Nap. commands troops at street battle of St. Roch church. Shoots hundreds in the streets. Nap emerges hero and champion of revolutionary gov. Dissolve the Convention. Initiate the new government of The Directorate. Run by friends of Napoleon who arrange his appointment as Commander of the Army of the Interior. It is at this time that he meets Josephine. Napoleon appointed Commander of the Army of Italy. Note Napoleon's interest in Italy as Corsican of Italian background. Napoleon triumphant in northwest Italy. Milan opens its gates to the French forces as liberators. (that attitude lasts very short time; soon they are hated). Napoleon defeats the Austrians in the northeast of Italy. Austria sues for peace. Establish the Army of the Orient: Napoleon. Goal: conquer Egypt, challenge British. Napoleon conquers Egypt; Wasn't as easy as he expected. Nelson destroys the French fleet. Deals terrible blow to Napoleon's plan for the Middle East. Napoleon initiates his Syrian campaign. France pushes in to Middle East. Napoleon journeys to Paris. leaves his army in the Middle East. Mobs turn out along the road to Paris. Napoleon treated as national hero. With the help of Paul de Barras, Napoleon engineers a coup. Overthrow of the government of the Directory. New Constitution establishes a new republican government. "Consuls" who rule. Napoleon as First Consul to serve ten years. Submitted to popular vote: overwhelmingly approve. People are sick of revolutionary chaos. Want order. Now begins the whole Napoleonic reorganization of France. Centralized system of Prefectures with Prefect appointed in Paris. Exists to this day. France the most centralized nation in Europe all thanks to Napoleon. Napoleon begins work on the Napoleonic Code, a complete reorganization of the legal system of France. Napoleon leads French forces over the St. Bernard pass. Fight the Austrians again in Italy. Napoleon wins the Battle of Marengo in Italy. France pushing Austria out of Italy. Concordat between the Papacy and France. In northern Italy The Italian Republic was proclaimed. Napoleon becomes president. Proclamation of the Empire. Napoleon as Emperor and Josephine as Empress. Both crowned in ceremony in Paris with Pope Pius VII in attendance. Nap places crown on own head in imitation of Charlemagne. Imperial office now made hereditary, pass to his brothers in absence of heir, establish elaborate imperial court rivaling the late royal court of Louis XVI. Napoleon now an absolute monarch but a modern one. Napoleon becomes the first real modern dictator with totalitarian power: secret police, press censorship, control army, control education. Coronation unleashes battle in Bonaparte family over issue of succession and who would succeed Napoleon in absence of heir (none in sight). Formation of Third Coalition against France: England, Austria, Russia. Battle of Austerlitz(north of Vienna, Battle of the Three Emperors), Austria two hundred thousand men, Russia one hundred thousand men, France one hundred thousand men. Total triumph for Napoleon over armies of Austria and Russia. Austria cedes vast territories to France. Napoleon proclaims the end of the reigning King of Naples. Places his brother Joseph on the throne as King of Naples. The Bourbon exiles withdraw to Sicily where the British protect them. Napoleon's other brother Louis becomes King of Holland. Battles of Jena and Auerstadt. Napoleon defeats the Prussians and in Nov occupies Berlin. One hundred thousand French troops invade Spain under pretext of protecting the coasts from British. King Charles IV, abdicates in favor of his son Ferdinand. Napoleon lures them all to Bayonne, forces them to abdicate then hands it to his brother Joseph. Result is general uprising of Spaniards against the French. Congress of Erfurt. Meeting of Napoleon and Alexander I of Russia to make peace. Kings and princes attend. Napoleon at the height of his power. Archduke Charles (brother of the Austrian Emperor) calls on Germans to wake up and drive out the French. War again, French reach Vienna in May. Treaty of Schonbrunn, Austria loses thirty two thousand square miles of territory and more than three million inhabitants. Throughout the German territories there are uprisings or attempted uprisings but the success of French troops stifles any real revolts. Napoleon divorces Josephine in public ceremony in which he promises to support her for rest of her life. (scene in palace after official divorce, he comes to her quarters and they hold each other and cry). Napoleon's secretary Meneval summed up her qualities: "Josephine had an irresistible attraction; she was not outstandingly beautiful, but rather, 'her grace surpassed any beauty,' as our good La Fontaine put it. She had that light abandon, that supple and elegant movement, that casual grace of the Creole. She was always even-tempered. She was good and sweet, affable and indulgent with everyone without exception. She was neither extremely intelligent nor well educated, her exquisite politeness, her great pleasure in society and at court, and her innocent artifices were always at her command, allowing her to know precisely what to say and do at a given moment. The emperor loved her very much." Lowly Corsican Napoleon Bonaparte marries the daughter of the Emperor of Austria Maria Louise of the Habsburgs. Now with Josephine gone and all his old friends away from court off in the army, and Josephine's son Eugenie also dismissed from his position in Naples cause reminds of Josephine, Napoleon more and more isolated. Birth of the son to Marie Louise that Napoleon so wanted. Lavishes rewards on Marie Louise. Napoleon at the summit of his power. Like some Greek drama: At the summit just before the fall. Napoleon prepares then begins his long planned invasion of Russia with the greatest army ever assembled in Europe to that time: six hundred thousand men. reasons: rivalry between Napoleon and Czar Alexander both of whom want to lead all of Europe and esp. Napoleon's marriage to Austria which now became a French ally. Russians retreat without a battle allowing Napoleon army to penetrate ever deeper and deeper into Russia stretching their lines of supply. Reach Smolensk. Napoleon mystified by the Russian refusal to fight. Russians continue to retreat and now the French occupy Moscow. Russians now torch Moscow making the city a rubble and useless to the French. With the Russians refusing to engage, Napoleon slowly reluctantly has no choice but to order a withdrawal. French withdrawal from Russia becomes wild chaotic flight with dead troops all along the routes. Only one hundred thousand of the original six hundred thousand survive. Napoleon reaches Paris. City in shock over reports from the Russian front. This is the beginning of the end for Napoleon. Prussia rises up against the French. Frederick William issues appeal to his people. He allies with the Russians. German princes now rise up against former French ally. Austria declares war on France despite fact that Emperor's daughter is the Empress of France. Battle of Leipzig ("Battle of the Nations"). Russia, Prussia and Austria field huge armies to encircle Napoleon. Allies storm Leipzig and Napoleon retreats west. Napoleon takes his army west across the Rhine at Mainz. Soon his whole German empire is gone. Allies pledge to cross the Rhine, invade France and go all way to Paris. Two hundred thousand troops of the Allies are now west of the Rhine in France. The British are penetrating France after success in Spain. In March they now win at Bordeaux. Allies take Paris. French Senate under leadership of Talleyrand declares that all Bonapartes have forfeited the throne and intermediaries convince to accept the position of the Allies. Napoleon abdicates unconditionally. Allies grant him Elba as a sovereign principality but his wife is not allowed to join him with their son. She retires to Vienna to be watched over by her father. Congress of Vienna: carves up all of Europe. Napoleon lands at Cannes with fifteen hundred men. Troops sent to deal with him go over to him, more troops and populace join on the march to Paris. March 20 Napoleon marched in to Paris to the accolades. Now begins the One Hundred Days. Allies now assemble over million men to put down Napoleon. Battle of Waterloo. Napoleon against the Duke of Wellington. Lasts all day. French slowly give. Napoleon flees. Tries to escape to America but finally has to give self up to British general. He was taken to England and taken as prisoner of war to the island of St. Helena in the South Atlantic off the coast of Africa where he spent the rest of his life till May 5, 1821.